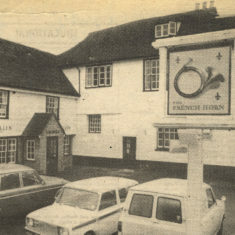 The French Horn in 1977. It closed in 1996. 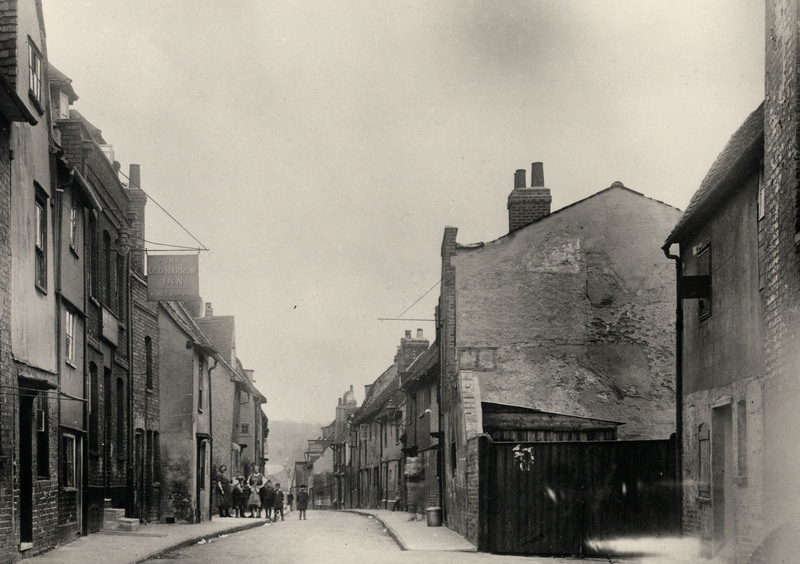 Kibes Lane (with the Jolly Bargeman on the left) in the 1920s. 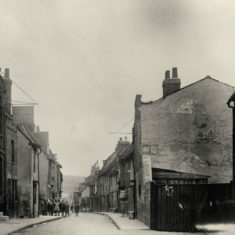 The whole street was demolished in 1936. A poem found many years ago in the loft at a house in Hertingfordbury Road, Hertford, lists every public house [46 of them] in Ware at the end of the 1920s. There was no indication of when it was written or by whom. It’s said there are some pubs in Ware, well yes, there are a few. This is the place where malt is made, so why not taste the brew? 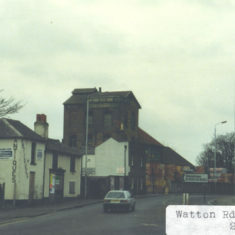 In London Road, the ‘Red House’ stands, an ancient bike on high. There are tea gardens at the side, so no-one need go dry. The ‘Gilpin’ brings to mind the man and his historic ride. The ‘Malakoff’ a foreign name, near the New River’s side. The ‘Royal Oak’ will shelter give, no matter wet or dry. Then cross to the ‘Railway Hotel’, where you can sleep and dine. In Amwell End, the ‘Eagle’s’ seen, the ‘George Inn’s’ on the right. The ‘Bull’ keeps watch upon the bridge, for ‘Victory’ is in sight. The ‘Star’ is seen both day and night, ‘Victoria’ welcomes all. The ‘Angel’ says ye thirsty souls, there’s drinks for all who call. The ‘Bell’s’ a pub near the pillar box, where bakers made their bread. The ‘Old Bay Horse’ is still alive, good luck he is not dead. In East Street is the ‘Dolphin’ seen, though he can’t swim at all. 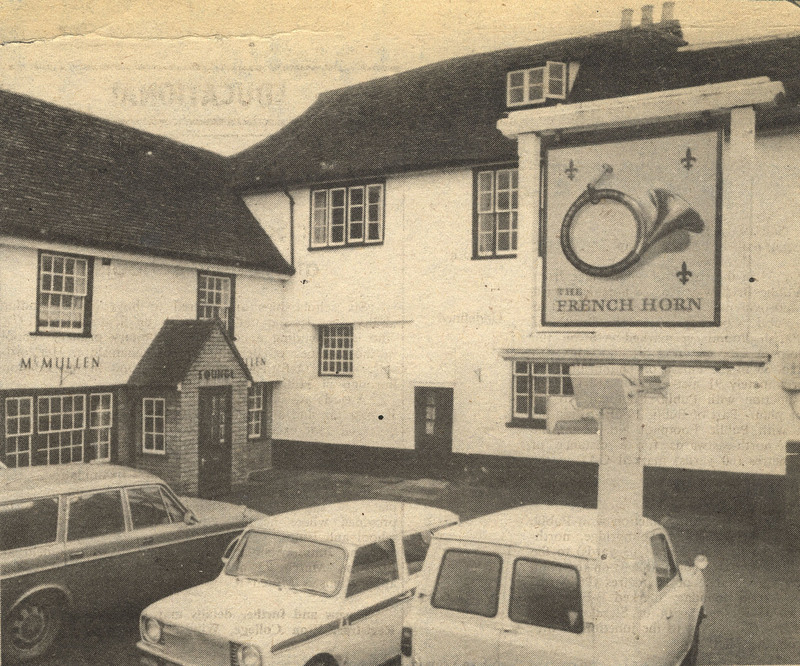 The ‘French Horn’ with its corner pitch, is on the council’s wall. The happy trio now appear, together in West Street. The ‘White Swan’ with its music charms, its guests who nightly meet. The ‘Wine Lodge’ is a modern house, the former was burnt down. There is a garden on the roof, the only one in town. The ‘King’s Head’ is a royal name, where you can happy be. Then plunge into the ‘Old Mill Stream’, with mill hands have a spree. The ‘Bull’s Head’ is a house well known, the ‘Garden’ was a sight. The ‘Wagon and Horses’ cars let out, for use both day and night. In the ‘Cabin’ you may rest, the ‘Albion’ song may hear. The ‘White Horse’ is a noble steed, the ‘Prince of Wales’ sells beer. The ‘Crooked Billet’ should do well, with council houses near. For should the water tower fail, they can fall back on beer. At ‘Windsor Castle’ we will stop and tally up our score. Tis forty six but wait a bit, I think there is one more. c) At the Punch House, forty live rats were let loose in the landlady’s drawing room, all killed by dogs. A resident would fill his mouth with live bees and let them out singularly among the customers. d) The landlords of the Punch House and Ye Old Brewery Tap had only a six days licence. 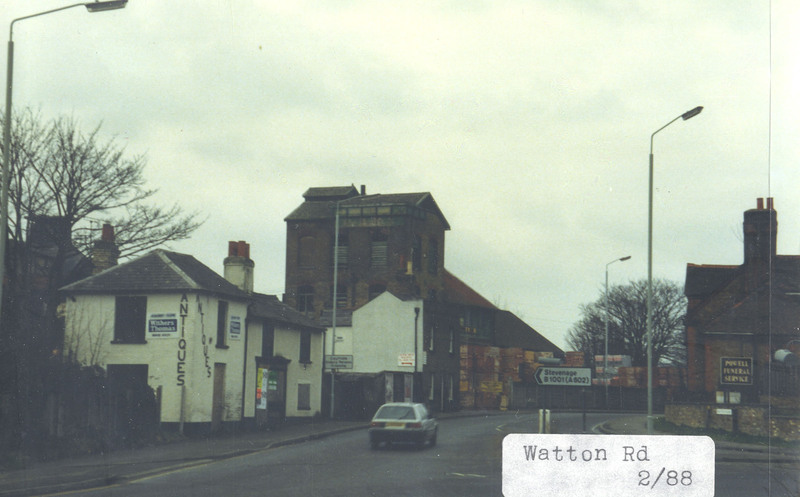 e)The two Rose and Crowns, now the Worppell and Old Rose and Crown were [and still are] on the way to the cemetery. Of all the pubs mentioned, only 19 remain in 2012. This page was added on 14/07/2012. The Roebuck was demolished March to May 2016. The Tap Bar is now ‘The Brewery Tap’ and The Worpell is ‘The Maltings’. The John Gilpin and the Cannon Tavern closed in October 2014. The Vine is now the Snug (2015) and the Roebuck is likely to be demolished. This poem found in the loft at the home of Mrs. Glynis Blakes, 78 Hertingfordbury Road, Hertford, lists every public house in Ware at the end of the 1920s. It gave no indication of when it was written or by whom. Now known to have been written by John Rogers a well know shoemaker in Ware.